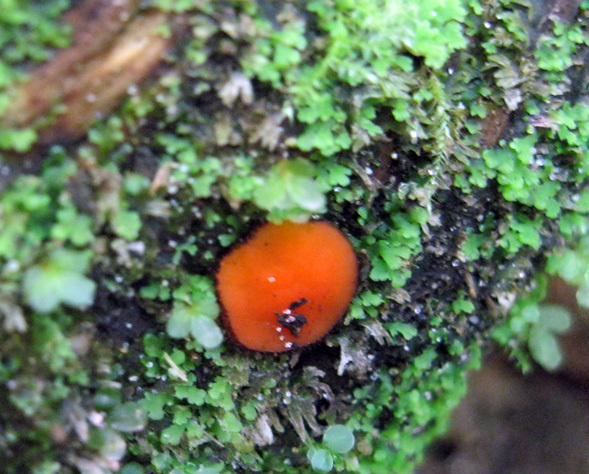 This cup fungus has shallow, stemless, bright red to orange cup-shaped fruiting bodies. The common name comes from the dark brown, relatively long eyelash-like hairs that cover the light brown outer surface and the edge of the cups. The fruiting bodies start off closed with a spherical, knob-like shape, and open into a conical then round-ish cup shape when mature. At maturity the cups measure 0.5-2 cm wide. They are usually densely clustered. Eyelash pixie cup grows on decomposing wood and bark, or nearby soil. It less frequently grows on other decaying plant matter. It grows throughout North America, and is also found in the United Kingdom and Europe. It can be found from spring to fall. While other Scutellinia species may only differ in morphology by microscopic features, they grow on the ground and not decomposing wood; S. umbrarum only rarely grows on pieces of decomposing wood embedded in soil. 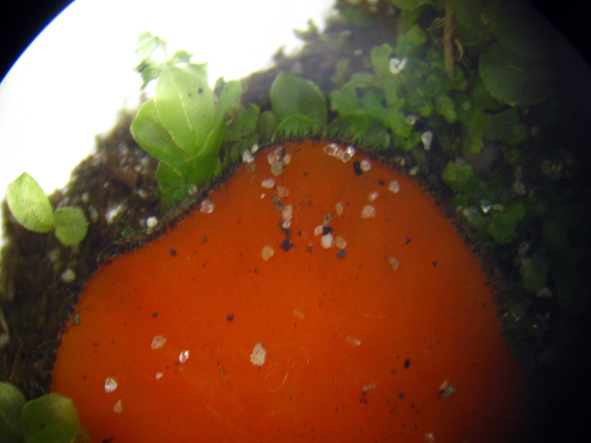 It also has shorter hairs than S. scutellata. Species of Cheilymenia (E-Flora BC notes records of C. coprinaria, C. fimicola, and C. stercorea in British Columbia) have a similar structure, but with yellowish or transparent hairs and a lighter orange cup. Common Eyelash - Scutellinia scutellata. NatureSpot. Accessed 10/06/2016. Gibson, I. Scutellinia scutellata (L. ex Fr.) Lambotte. In Klinkenberg, Brian (Editor). E-Flora BC: Electronic Atlas of the Plants of British Columbia. Lab for Advanced Spatial Analysis, Department of Geography, University of British Columbia, Vancouver. Accessed 10/06/2015. Lincoff, G. H. The Audubon Field Guide to North American Mushrooms. New York: Alfred A. Knopf, P. 353.